The Nintendo Switch has certainly become the hotspot hangout over the past few years for the couch co-op battle games. From AAA titles like Super Smash Brothers Ultimate to a plethora of indie contenders, each showcases a hook that entices friends to sit around and beat the heck out of each other in some form or another! In the case of Bombfest, a physics-based competitive party game that (you guessed it) utilizes bombs to blow up your opponents, we find a game that brings some niceties to the table, but struggles to stay competitive in this genre’s landscape. The premise of Bombfest is as straightforward as it gets. You’re up against 3 friends or AI opponents tossing bombs at each other until its the last man standing. You’ll take control of little wooden figures that are oddly reminiscent of a more simplistic version of Fisher Price’s Little People. Movement across an arena consists of them rolling or flopping over themselves, which fits the overall ‘toy’ theme & scale that the game was positioning itself in. Gameplay is very accessible in that you’ll only be required to move around and pick up/throw bombs, the latter being controlled simply with a single button. The bombs themselves come in various forms as you progress and unlock more to play with. However, this is where I felt the game could have used some more refinement, since no matter what kind of bomb you have, they all explode identically, which ultimately detracts from any sense of unique mechanics that they are intended to have. For example, the ice bomb that slides around when thrown would have been much more interesting had it exploded into ice chunks or shards. This would have also given the game some nice visual variety as well. As a further challenge that comes with any physics driven game, there’s often a lot of inconsistency in the core gameplay. A bomb exploding would oftentimes launch me entirely off the playable arena, while another similarly placed bomb in proximity to me would just cause me damage. This type of randomization leads to non-strategic gameplay. Coupling this with the lack of any differentiating bomb outcomes (they all explode the same), you’re left with simplified avoidance gameplay vs. strategically trying to win a match. Every match just felt too random and uncontrolled when playing with a few friends or going up against the AI because of these elements. The arenas that you compete in are scaled for the toy size figures. You’ll find yourself playing in places like the kitchen sink (complete with a drain that serves as a pit of instant-death) to a bedside stand with a little wooden train that moves around. Each of these arenas generally offer physics props such as wooden blocks or game pieces that help create barriers from the bomb explosions, and also serve as a way to circumvent your opponents’ field of view for throwing bombs at you. It’s a nice touch for each arena, and one area where the physics randomization plays well for the game, as it’s effectively altering the game arena each match to an extent. Unlike many of the other party titles out there, Bombfest doesn’t give you everything right from the first boot of the game. There’s a lot of content to be unlocked the more you play by way of a content trickle drip system which I personally was quite happy with. As you complete more matches, you’ll unlock new arenas, new base characters, outfit options, and later on modifiers such as the classic Big Head Mode. Being excited about Big Head Mode, I equipped that along with my trusty Top Hat disguise outfit, but found that the top hat and mustache didn’t scale along with the newer large head I had used, thus resulting in clipped outfit pieces that looked quite poor. Regrettably in my time with the game I encountered additional issues, including getting stuck in the character select menu a few times and even a complete reset of my save game after several hours of gameplay, losing all of my unlocked bombs, outfits, people, etc. After contacting the developer, I was told that this will be resolved by release, so here’s hoping you won’t have to deal with that! Bombfest enters the quickly overcrowding party party game genre with a few niceties, but struggles to stand out amongst some strong contenders in both AAA and indie alike. The game also feels like it needs a bit more time in development to clean up some bugs and problems I encountered during my time with the game. While not totally bombing out as a fun multiplayer experience, I’d love to see more improvements made to it to help give it a stronger identity and maybe offer some improved player strategy options. 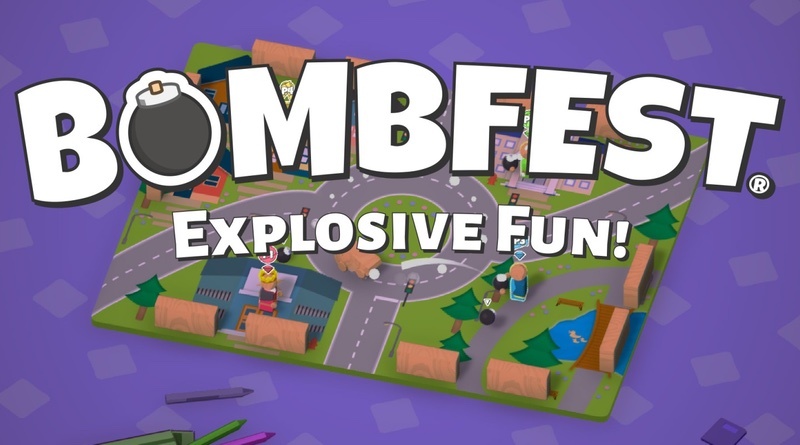 Bombfest is a physics-based brawler that, while visually cute, falls short of bringing much in the way of strategic gameplay, coming off far more random in outcomes than desired. There’s a lot of content that can be unlocked which is wonderful, but when it comes to new bombs, they just don’t stand out as meaningful, resulting in more of a bland execution than desired.